When I said that a painting can capture beauty unseen in photographs, it was Linda Hartough’s work that I had in mind. The level of detail, colors, and care taken in her paintings is jaw-dropping. I appreciate the thought and care she took in her answers for this interview and I hope that it inspires you to discover more of her work! 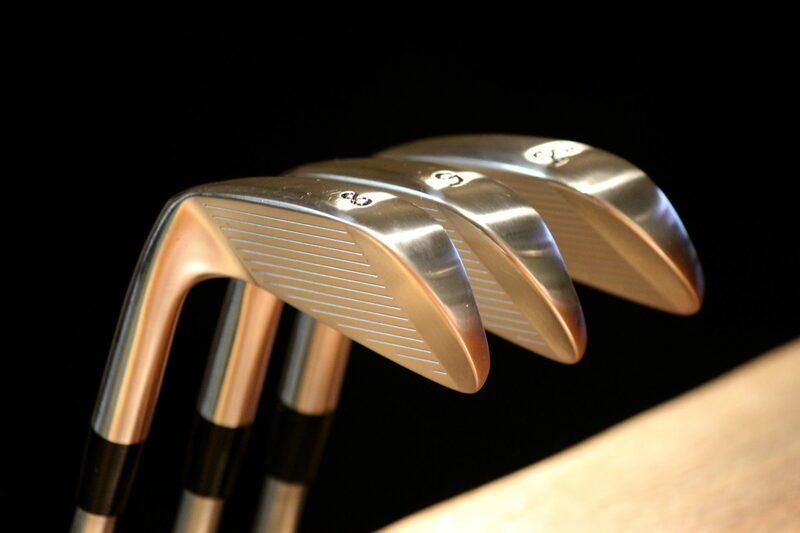 Q: Your name is synonymous with golf art and it is obvious that you know golf courses on an intimate level. Do you play the game yourself? I am an avid watcher and fan of the game as well as all of its traditions and history. After 30 years of painting in this genre, I feel the same as if I had always played the game even though I have played only nine holes, when I was thirteen. 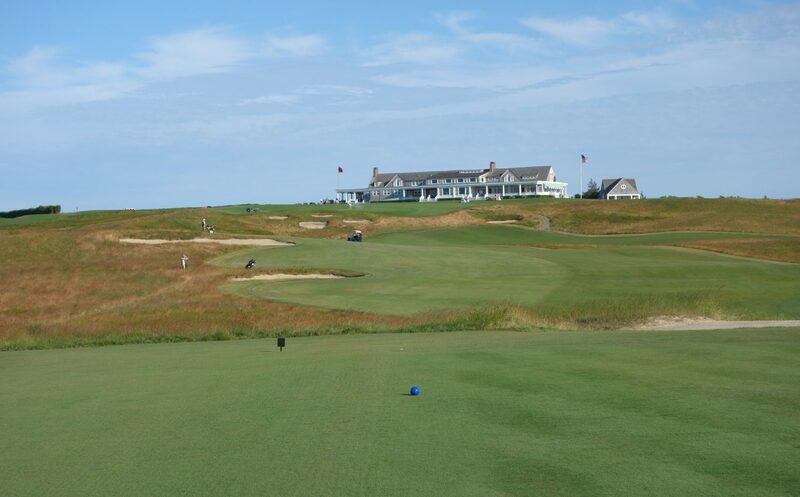 The game of golf is a discipline, and I instinctively knew, after my nine holes, that my time was already involved in the discipline of painting and there was not room for both in my life, but my respect for the game has always remained. The visual part of the game has to do with the landscape and that’s my main inspiration to create art. 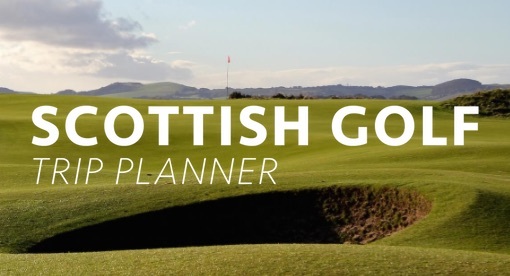 Q: Give us some insight into your process as you approach a golf course commission. I first like to go to the course and view it from the first hole to the last to get the feeling and character of the whole course. Then I narrow it down to the holes that best sum up those feelings and try to find the best view and lighting that will make it an exciting composition, with the lighting supplying the drama. Feedback from the members and golf staff is important in making the decision. A lot of time is then spent on getting all the photos I need for reference (thousands of photos!). The painting is a success when all the elements come together to make a work of fine art. 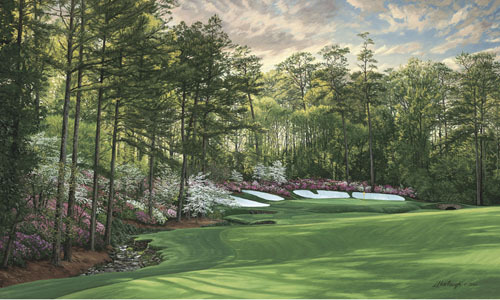 Q: What was it like to receive a call from Augusta National Golf Club commissioning a painting during the early days of your career? Was it an “I’ve made it!” moment? Not exactly! I knew it was important but you have to realize in 1984 there was no golf art genre in the US and no established market to distribute any prints. What few prints that were out there were inferior quality and cheaply made. My entire life and background in art was all about the finest art I could create so if I was going to specialize in this genre, then I wanted to bring state-of-the-art printing to it as well as fine art. It took until 1988 to make that decision to go full time with golf landscape. I did realize the potential of it being a good market early on, but it took a lot of word-of–mouth marketing to even begin to develop a business out of it. I knew I was attracted to golf people because they were so appreciative of my golf landscape, but developing a market took many years. 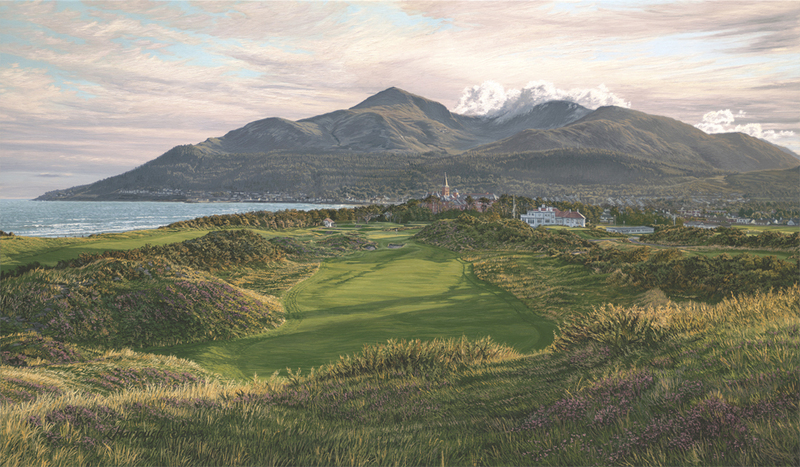 In 1990, I was commissioned by the USGA to do the annual paintings at the U.S. Open Championship Courses, and in the same year I started the Open Championship Courses Series commissioned by the R&A. That was how the market got developed. 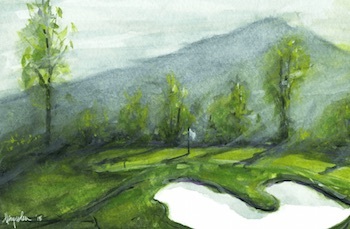 I have to say that starting with Augusta National was the best start possible – my golf-landscape painting career probably would have never happened without it. I would have been painting just landscape all these years! 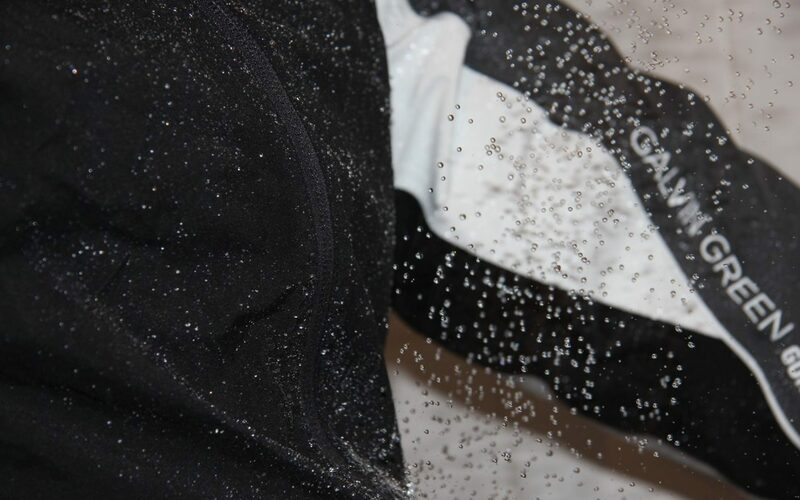 Q: The detail in your paintings surpasses that of some photographs. 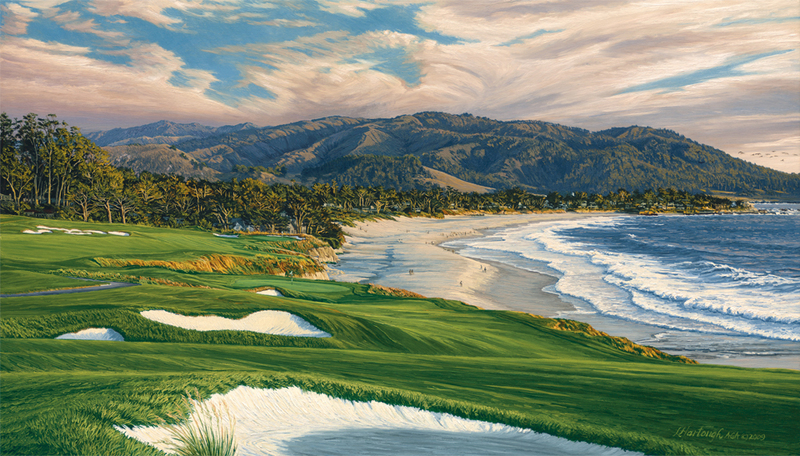 How has your painting style developed over the years, especially as it pertains to painting golf courses? 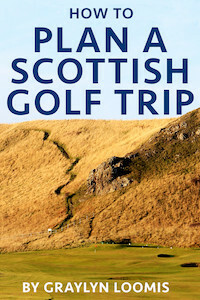 I think the detail has increased over the years with an ever-increasing desire on my part to make the viewer see exactly what the hole’s challenges are for the golfer. The lighting is very important to show off those design elements, and hopefully viewers can place themselves in that timeless moment and feel what it is like to be there. The time it takes to create a painting is a process of many months, sometimes up to six or more. I wish I could produce them faster but, if anything they are taking longer! I have always used oil paint in a fairly thick textural style in the “alla prima” method, which requires the painting to be completed while the oil paint is wet. Since I have so much detail in my paintings and even oil paint dries in a few days, I have developed a way of doing this by painting and completing one small section at a time. The process can be seen on my website on the work-in-progress section. Q: Do you have a favorite golf course to which you continually return, hoping to capture another perspective or hidden view? Absolutely. 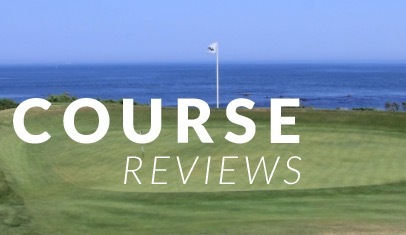 I have several, such as Augusta National, The Old Course in St Andrews and the Pebble Beach courses, including those on the Monterey Peninsula. It always amazes me how the same place can be so different according to the angle of the sun and the season. Every trip has its own set of variables that can make it different. I have photographed Augusta since 1984, and every year it looks different. 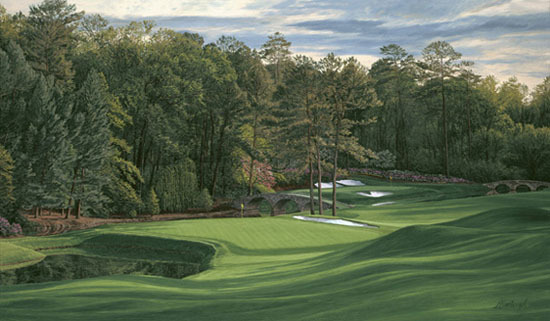 The 13th Hole of Augusta, which I have painted no fewer than six times, had a magical lighting and glow when I photographed it in 1999 which produced a painting in 2000 I think of as my definitive 13th Hole painting of all time! 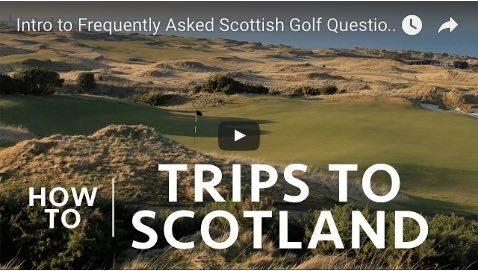 St Andrews is also a place I must go to every time I go to Scotland – it is all about the light at a particular time of year and how the weather has affected the vegetation. Have a look through Linda’s website to see the rest of her work! I also highly recommend taking a look through her “Work in Progress” section, giving some insight into the work and detail that goes into her paintings.